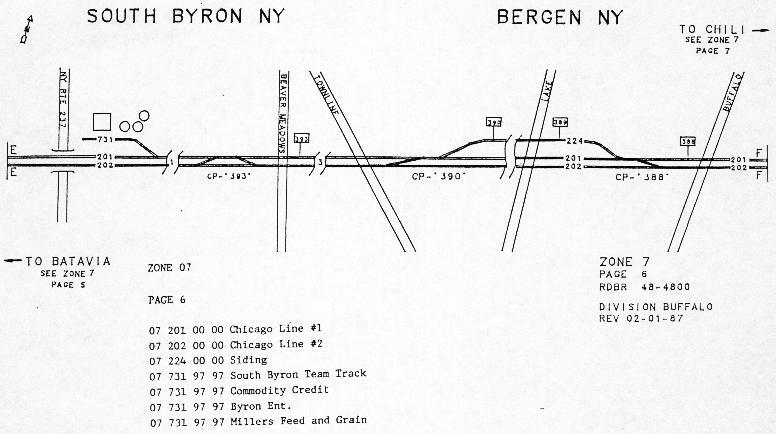 As the name implies, this line is the main CSX line running from New York City to Chicago. 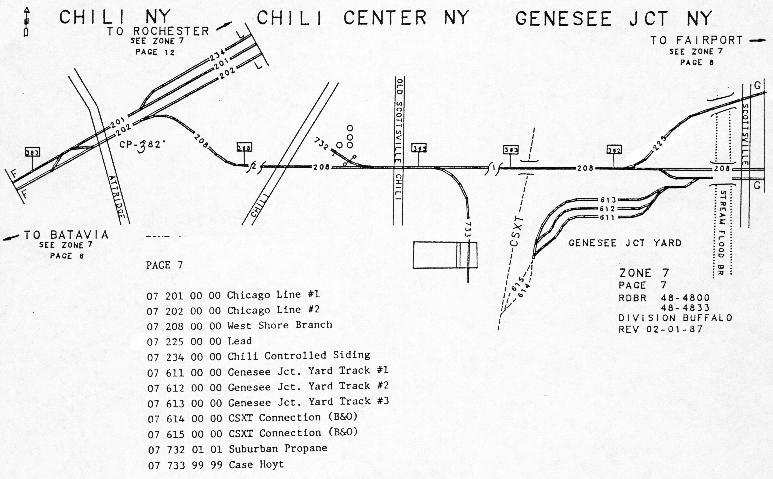 Several online customers have spurs off the Mainline, as well as the interchange point for the Depew, Lancaster and Western, Rochester & Southern and Ontario Midland shortline Railroads. 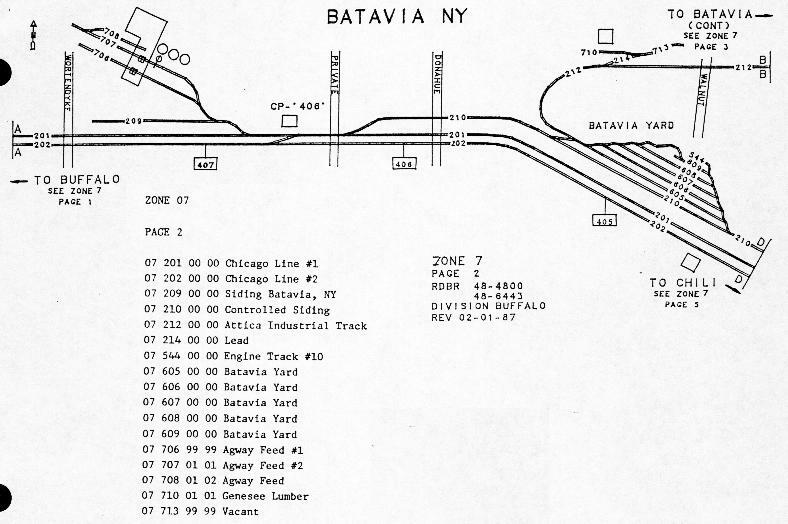 Expect to see well over 50-60 trains per day on this mainline, with speeds of up to 60 MPH for freight and 79 MPH for Amtrak. 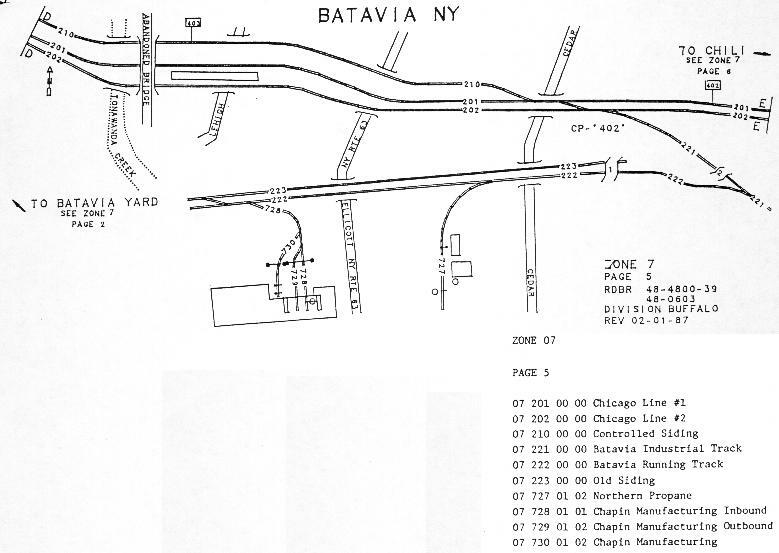 This single track line is used as a freight bypass when traffic around the Goodman St. Yard and Amtrak Station gets busy. 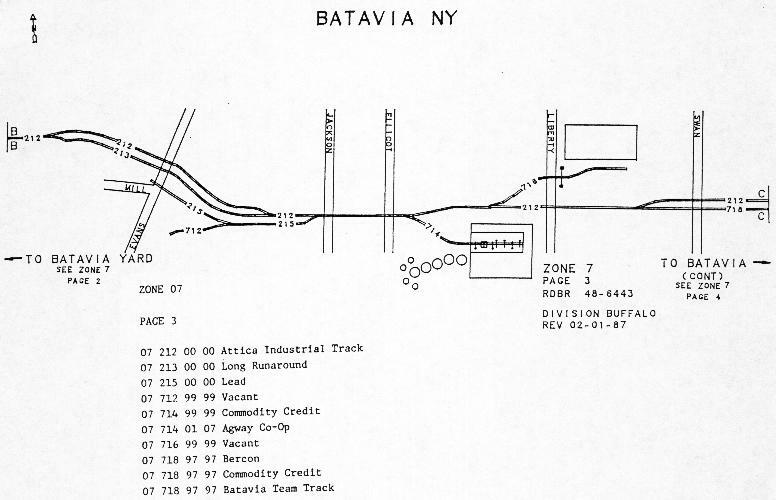 It is also used as the interchange point for the Livonia, Avon & Lakeville Railroad at Genesee Junction, and by several online customers. 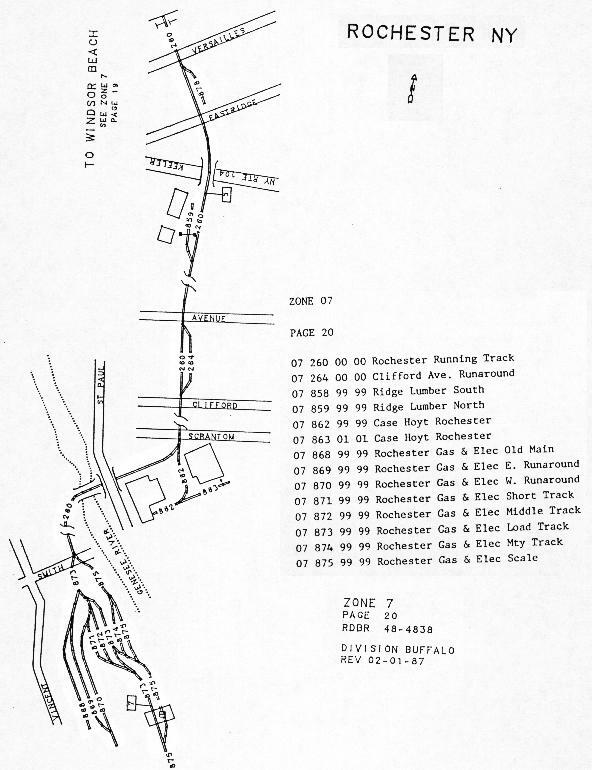 The Rochester and Southern RR has trackage rights for about a half mile from Genesee Junction to the Mortimer Industrial Track (remnant of the former Pennsy Line) where they service Lyell Metal, 84 Lumber and a gravel/cement company. 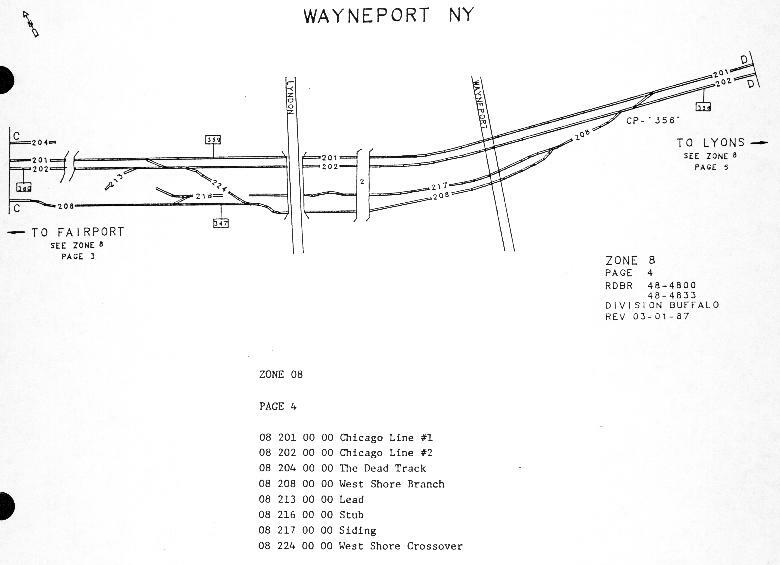 The West Shore Branch was upgraded in 1986 with continuous welded rail. 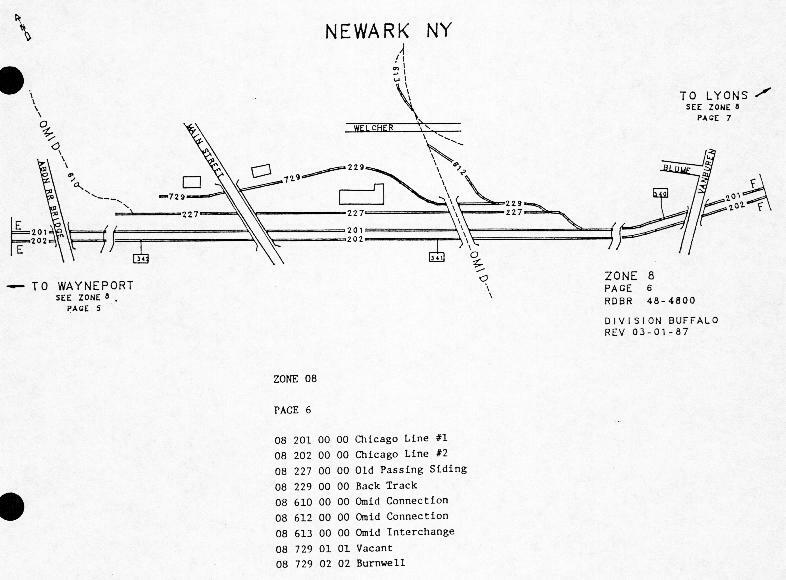 The speed limit on this line varies between 45 and 60 MPH. 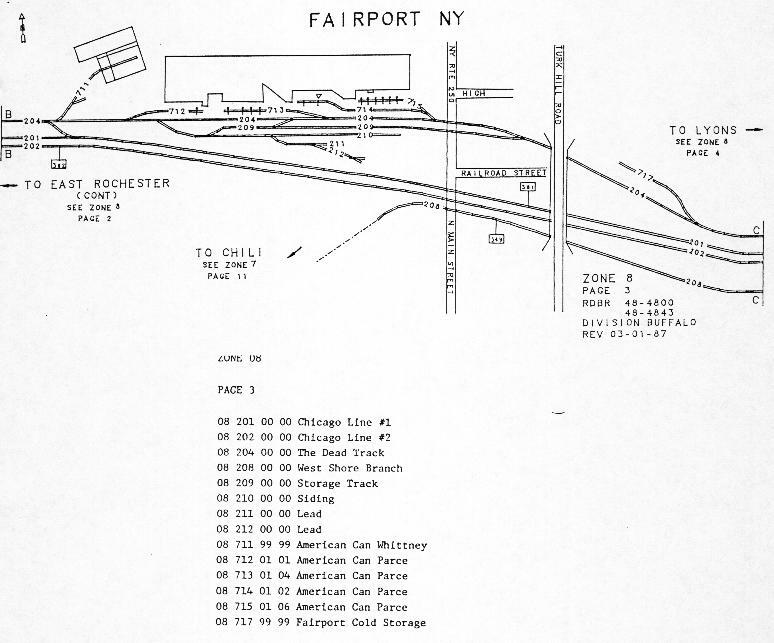 The West Shore connects with the Mainline in Fairport at MP 359 and in Chili at MP 382. 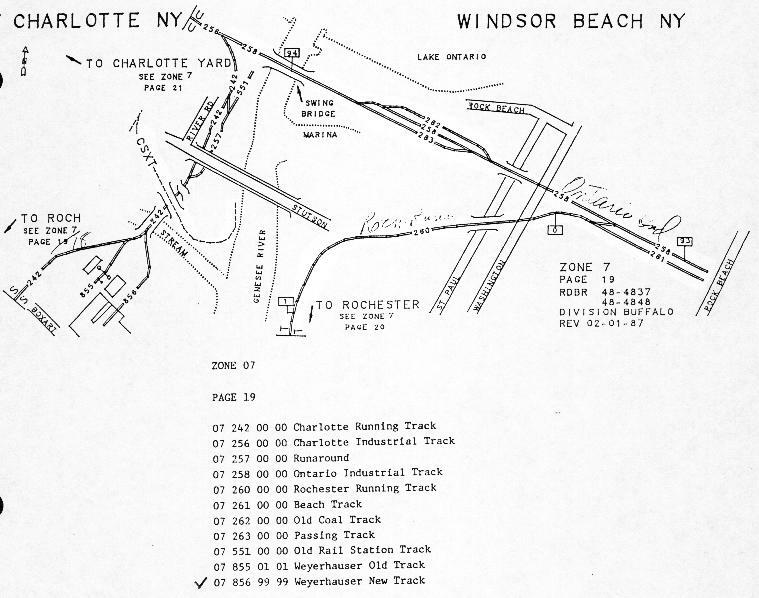 This important running track runs north from MP 373 on the Mainline to what was the "Hojack Line" or Ontario Branch in Charlotte. 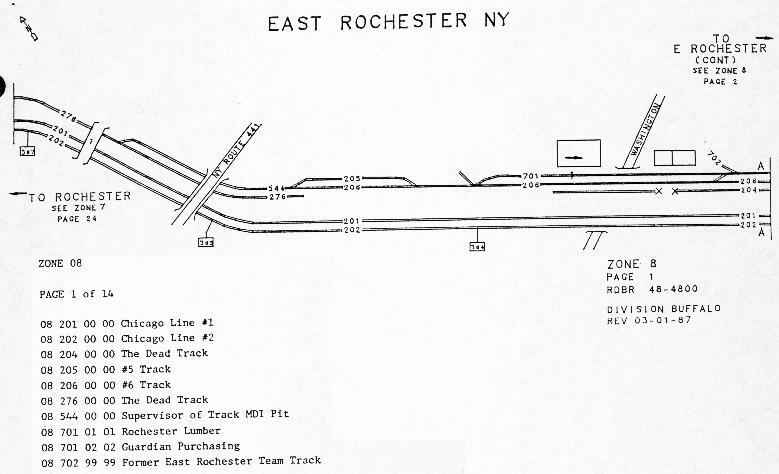 What makes this track so important is CSX's two largest Rochester customers, the Eastman Kodak Company and Rochester Gas & Electric's Russell Station rely on this track for continuous coal shipments for their power generating plants, as well as raw materials for Kodak's huge photographic and film manufacturing complex called Kodak Park (who maintains thier own interplant railroad). 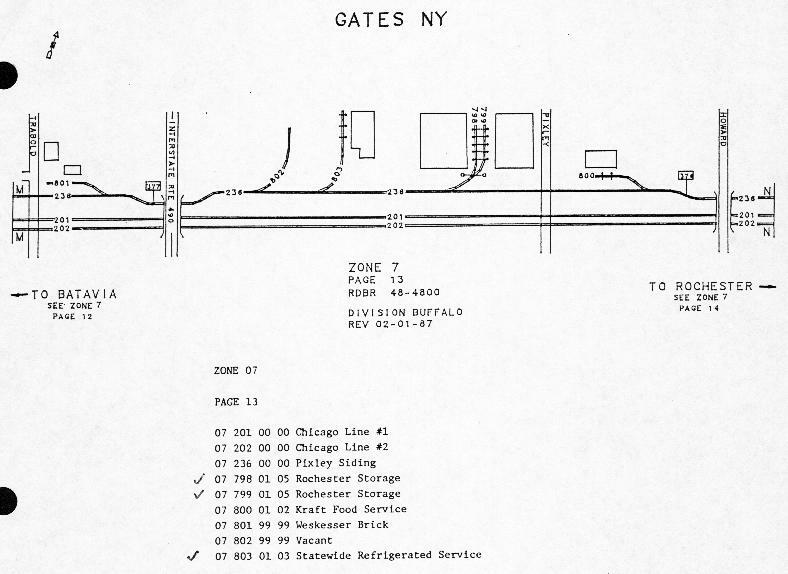 A handful of smaller shippers are served off this line. 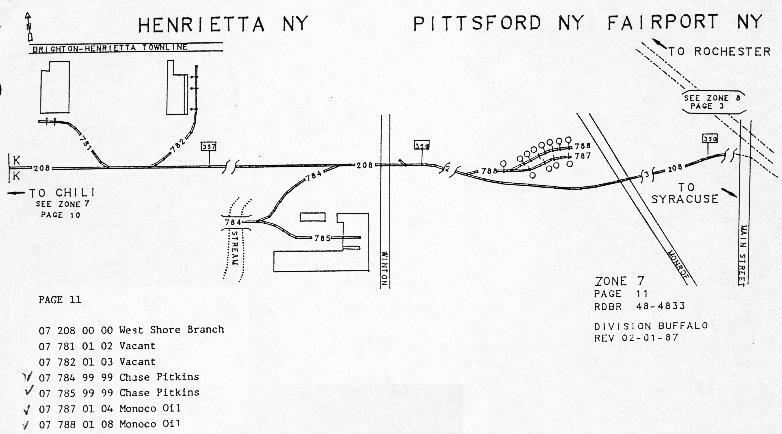 Originally running from Rochester to Niagara Falls, the Falls Road Branch was completely abandoned and torn up between Lee Road in Rochester and Owens Road in Brockport in 1994 due to lack of business on that stretch. 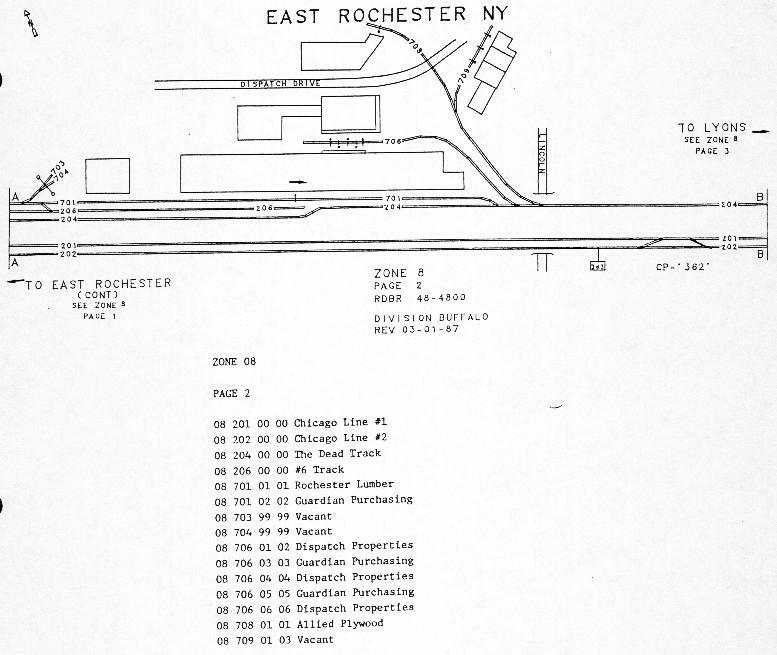 The remaining stub of this branch in Rochester services the Monroe County Recycling Center on Emerson Street on a weekly basis and two scrap yards along the line are slated to come back online in 2000. 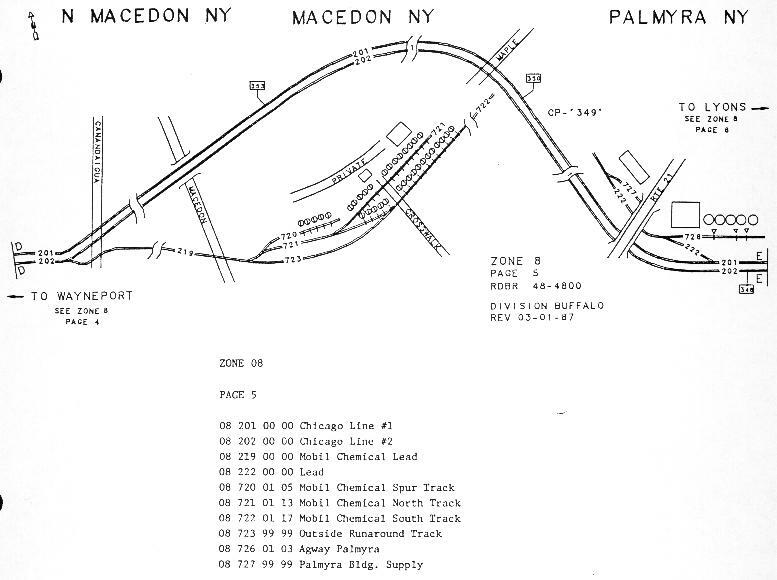 This lead to the Mobil Chemical plant in Macedon sits on what was formerly the West Shore Railroad. 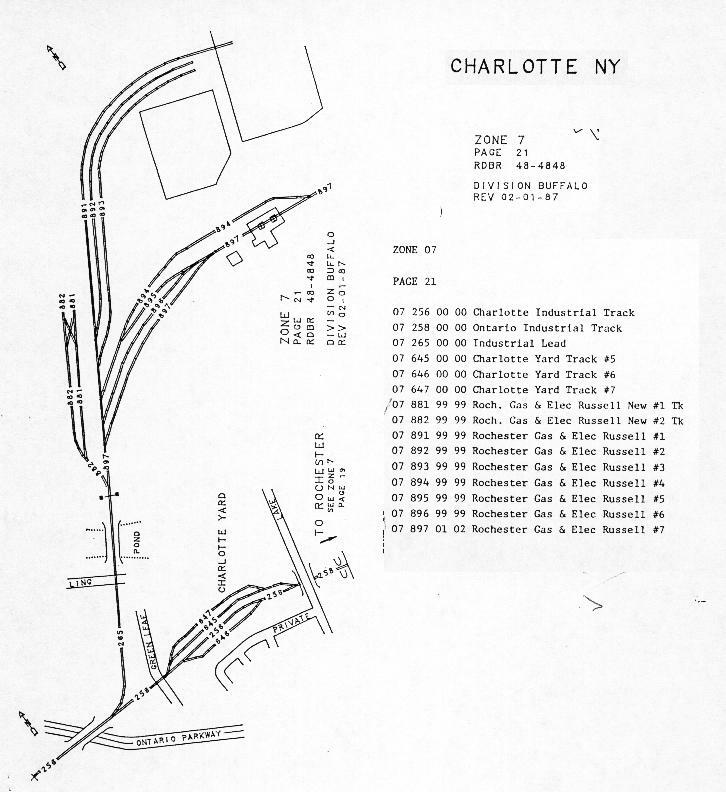 CSX also has the ability to communicate with their interchange partners on their frequencies as well. 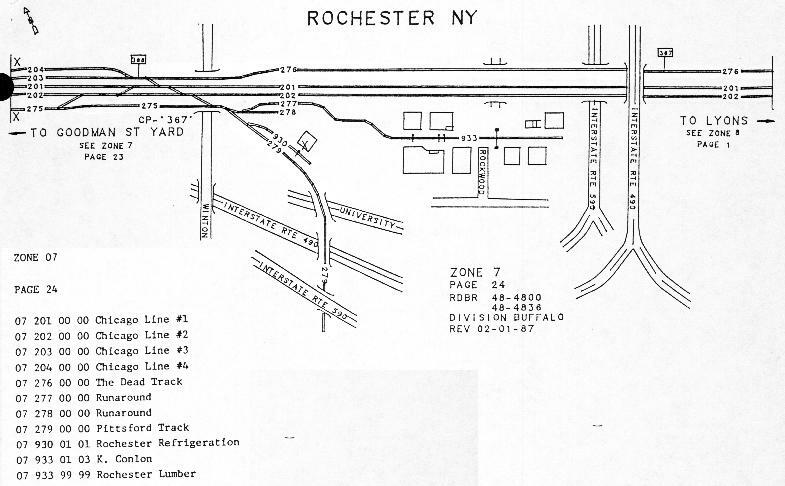 For more Rochester area railroad frequencies, click here. 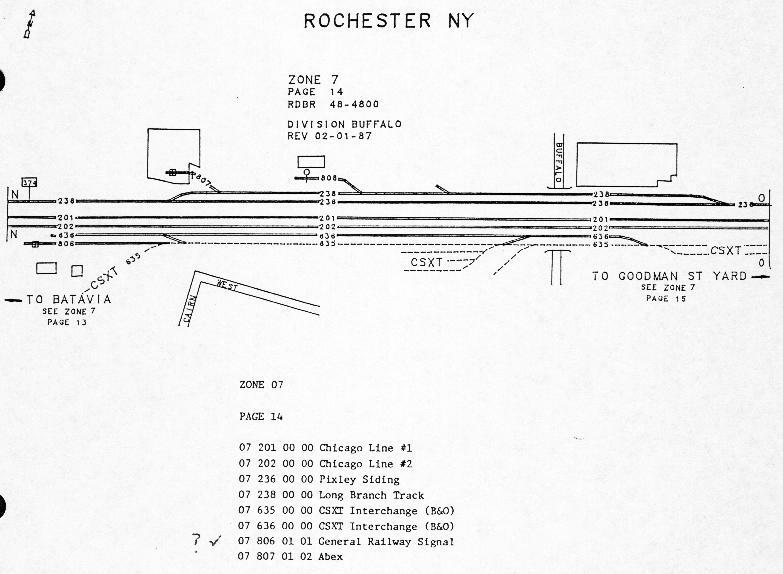 You can now view Conrail ZTS maps of CSX's Rochester territory here! 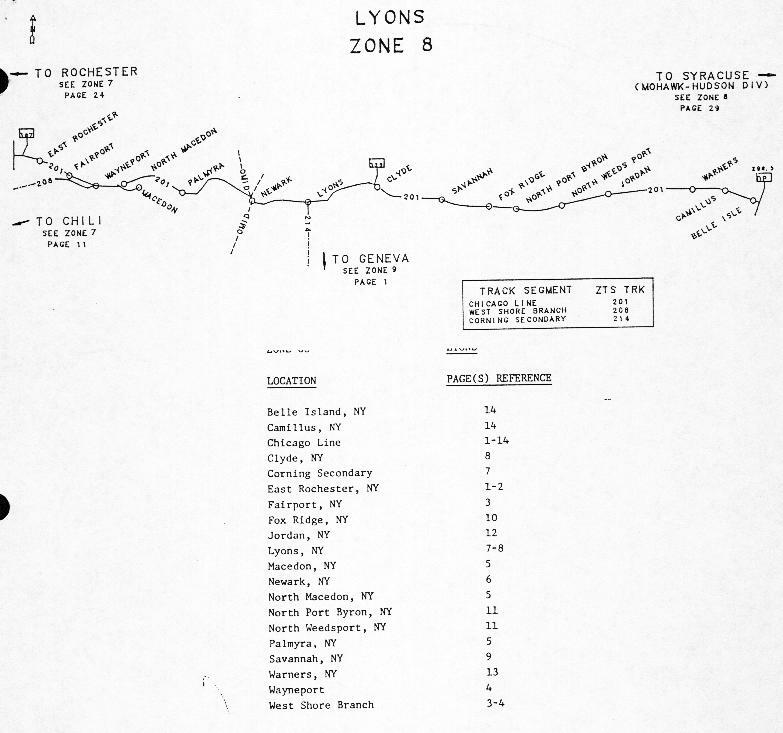 The maps on this page cover all of Conrail's Buffalo Division Zone 7 and part of Zone 8 to Lyons. 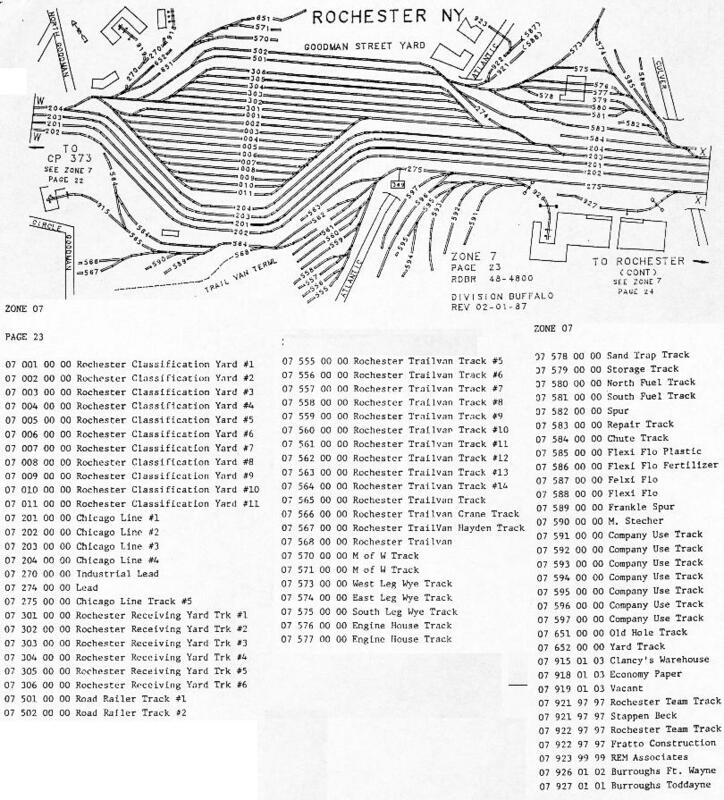 Each map is in an 8-bit, 256 shades of grey .JPG file format. 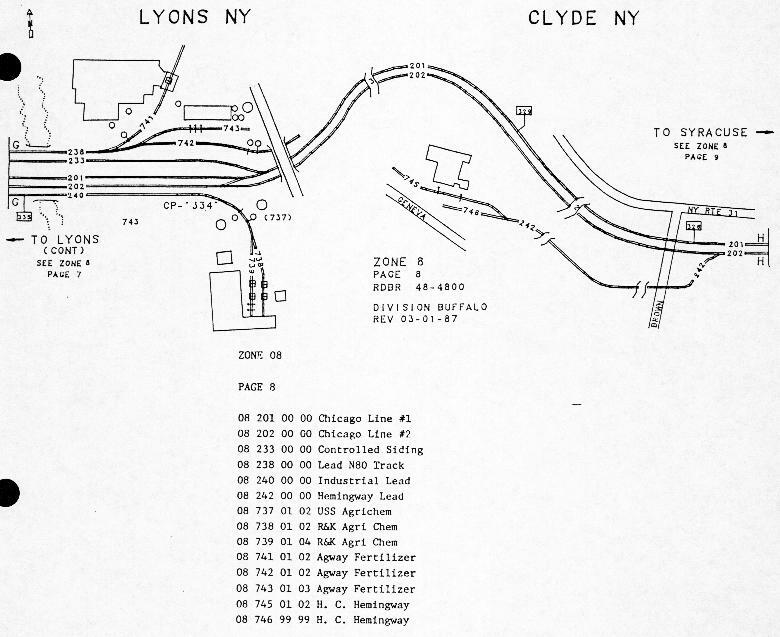 Also, check out this version of the timetable from MP 296 to MP 410, as well as the West Shore Branch!! 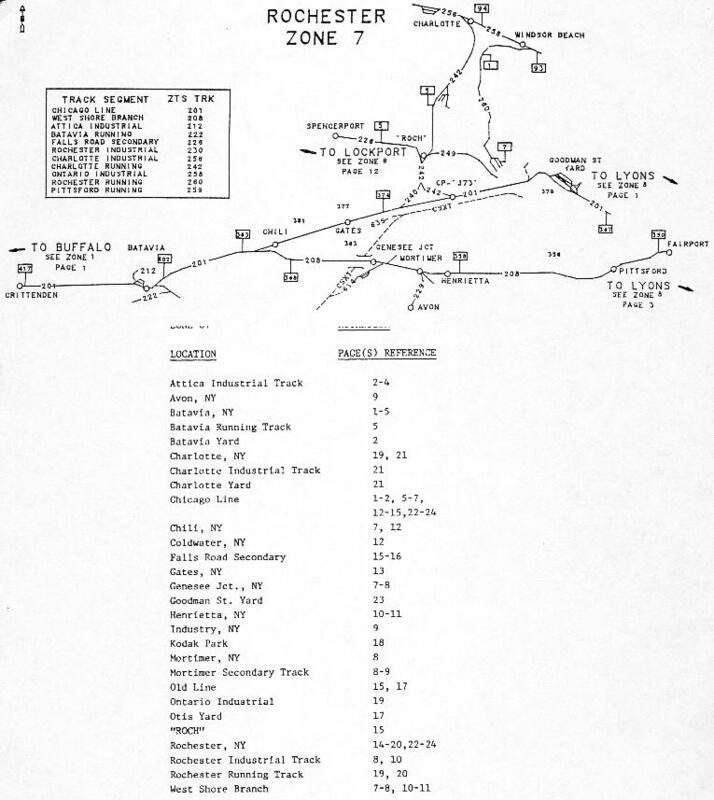 These timetables were created in a Microsoft Excel 7.0 spreadsheet. 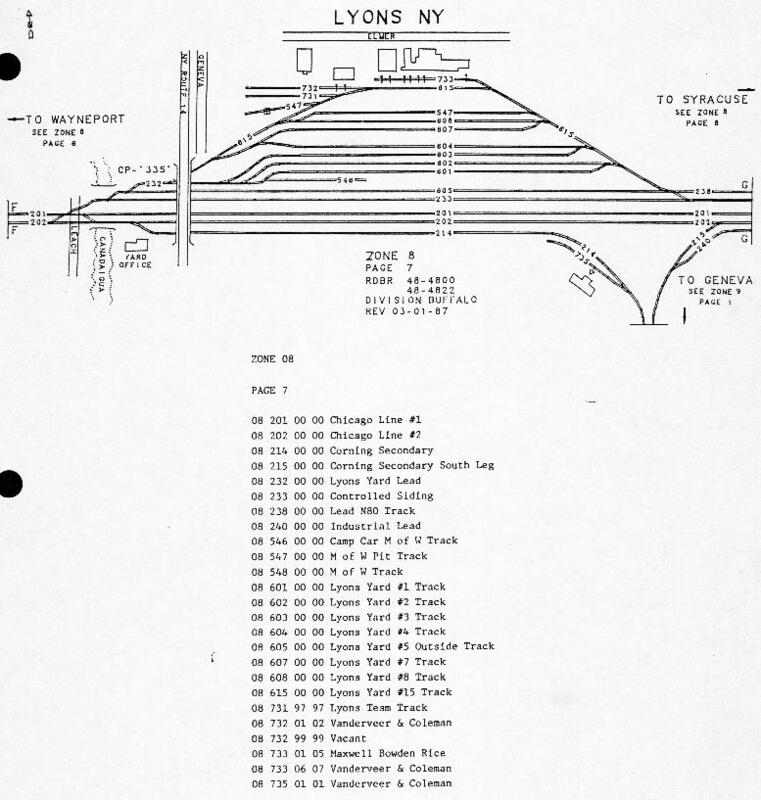 This is a zipped file and you will need MS Office 95 to view it. 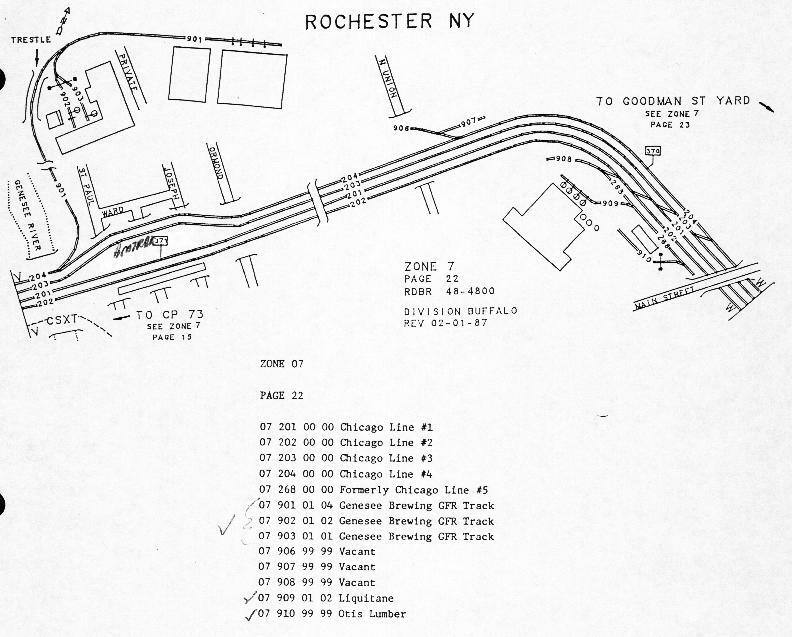 Mainline Genesee Brewing St. Paul Blvd Rochester Hops. Beer company also brews Samuel Adams. 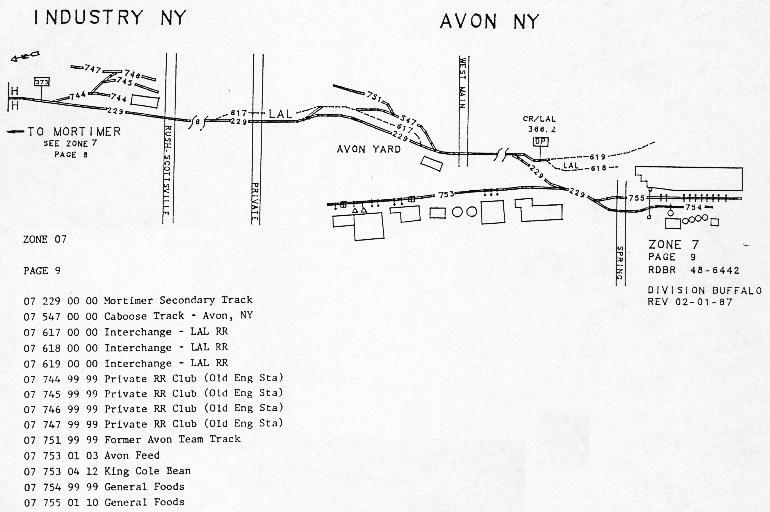 Company track nicknamed Genesee Falls Railroad (GFR) by local CSX folks. 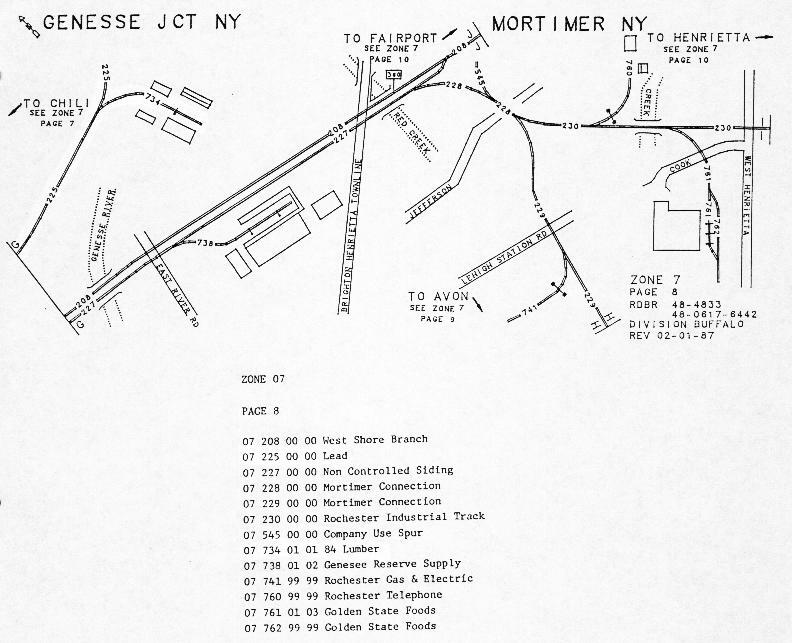 Currently the trestle to the brewery is out of service for repairs. 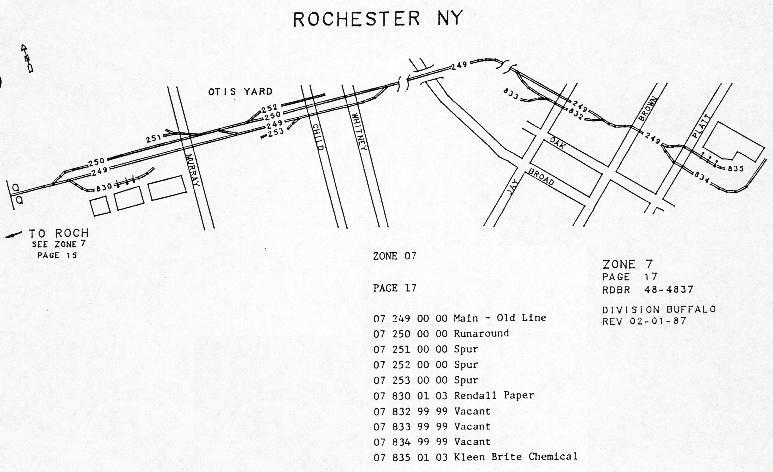 Mainline Western Bituminous Products Rockwood St. Rochester Coal and coal products?? 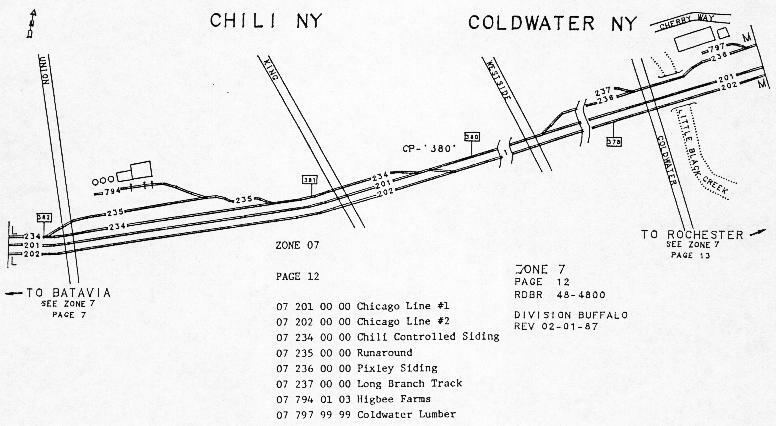 unverified - on the "Brighton Siding"
Mainline Rochester Lumber East Ave / Rockwood St. Rochester Lumber - on the "Brighton Siding"
Mainline Cantisano Foods Whitney Rd. Fairport Tomatoes, jars, etc. Serviced 2-3 times weekly. 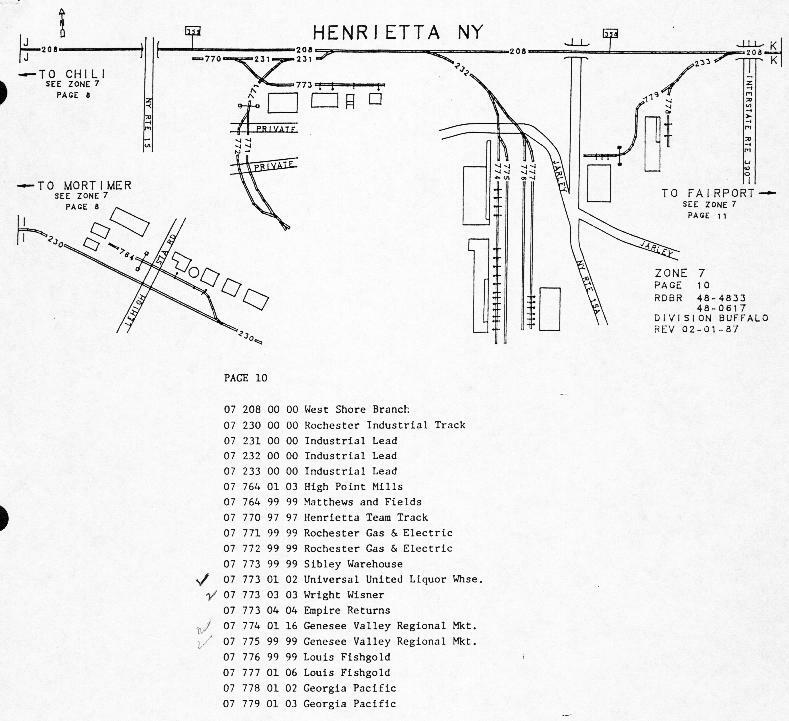 West Shore Genesee Valley Market Jefferson Road Henrietta Switch still there, tracks still there, crossings paved over. 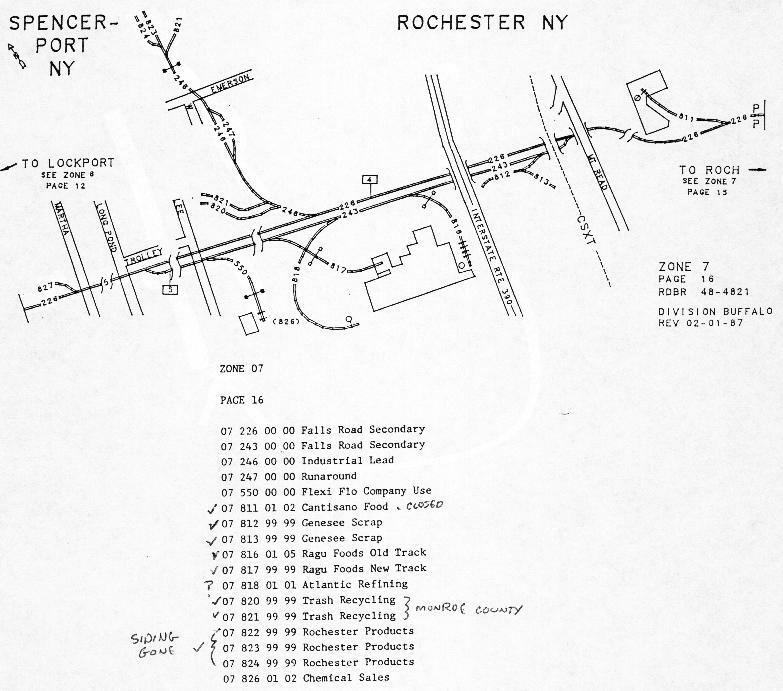 West Shore Monroe Oil Co. (Monoco) Monroe Ave. Pittsford Home Heating Oil Out of business.